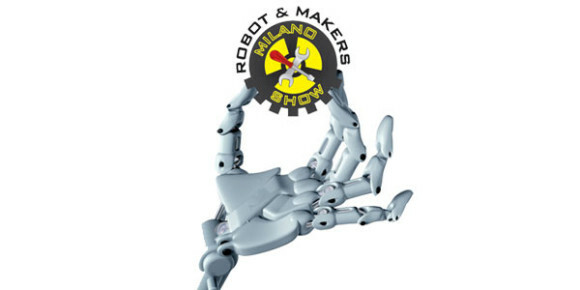 Next weekend - March, 29-30th - Parco Esposizioni Novegro, near Milano, will turn itself into a big meeting point for anyone interested in robotics and Makers, thanks to the first edition of Robot & Makers Milano Show. The exhibition will host the most important italian and international distributors of robotics, but most of all a great number of tinkerers and inventors, with booths full of stuff to play and have fun with. We couldn't miss this event, of course, and actually we'll be a big part of it, in two ways: many of our vendors will be there to show their products and we've organized an interesting schedule of workshops during all the weekend. At Robot & Makers you'll meet the people who are "behind" some of our most important Stores. In strictly alphabetical order: 0Lab, Atelier Macramè, Bussola Creazioni, Darq Design, Design185, En=Joy Gioielli, Fucina, Girigogolo, Ideatagliolaser.it, Je t’aime (pour tojours), Lofficina, Magnetic Snail, Studio MP, Thin-k, Tribu, Vicenza Thunders. You'll also be able to buy their products: sales will be finalized online, as usual, but with no shipping costs and with special discounts for Robot & Makers attendees. During the event we have planned eight workshops. Robot & Makers is open to the public from 9 to 18 on Saturday and from 9 to 17 on Sunday. Entry ticket price is 10 euros (reduced price 5 euros). More info on official site .